Huge Savings Item! 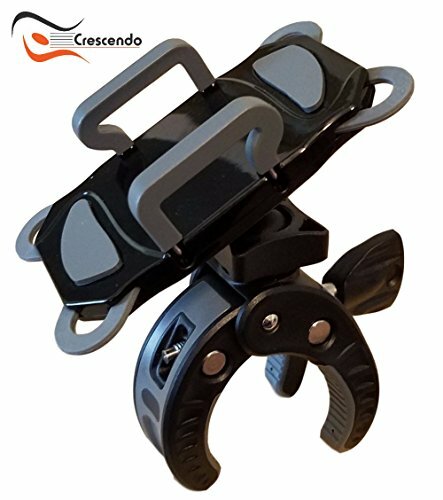 Save 16% on the Crescendo CR-30 SlimClip Smart Phone Holder | Mount Clamp for Microphone Stand, Boom, Pole, Mic or Music Stand | Apple iPhone, Samsung Galaxy or Note, Google Pixel, LG, HTC, Moto, OnePlus by Crescendo at DJ Luu. MPN: CR-30. Hurry! Limited time offer. Offer valid only while supplies last. LOW PROFILE, STRONG CLAMP- WHILE OTHER MIC STAND PHONE HOLDERS have complicated mechanisms, are too obtrusive or top heavy, or simply not sturdy enough and cheaply made, the CR-30 SlimClip holds securely to BOTH your phone and the mic stand or boom, and then gets out of the way of your performance. The CR-30 locks in place with a smooth rotating screw and snug fitting claw-like mount to a wide range of widths and applications. NO MORE FRUSTATION with cheap inflexible non-secure bulky mounts. The compact CR-30 SlimClip attaches easy to any size mic stand and with the strong silicone rubber bands to lock your cellphone in place you can set it and forget it for the night. Because the CR-30 SlimClip is small and discrete you never have to worry about your stand tipping over but due to the unique design of the clamp you can still get the attachment angle you want! OUR MISSION is to provide the best value possible for our musician customers with quality products, superior customer service, and industry leading 3 year warranty for your piece of mind. If you have a problem at any time with the CR-30, simply contact us and you will be amazed at the level of support you receive. We are on fire for our customers! FOR ALL SMARTPHONES - iPhone, Samsung Galaxy and Note, Nexus, Motorola, LG, Google Pixel, Apple, Android, you name it! 3 YR WARRANTY and 90 days no questions asked return policy. If you have any questions about this product by Crescendo, contact us by completing and submitting the form below. If you are looking for a specif part number, please include it with your message.